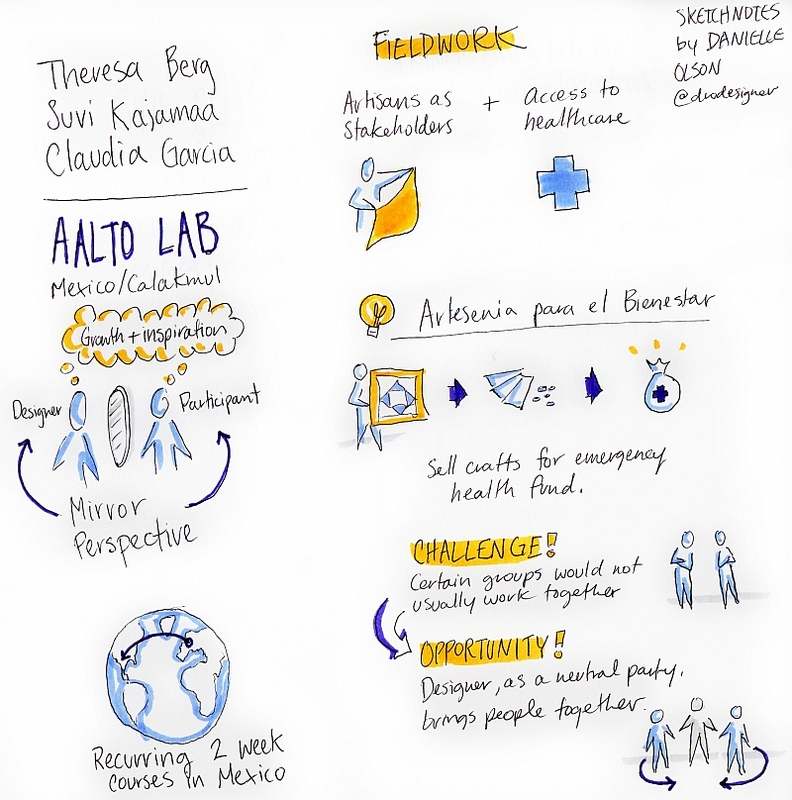 Berg, Theresa and Kajamaa, Suvi and García, Claudia Garduño (2014) Benefits of design practice in fieldwork: How ‘Artesanía para el Bienestar’ emerged in the field as a concept to Improve access to Healthcare in a Mayan Community in Campeche, Mexico. In: Proceedings of RSD3, Third Symposium of Relating Systems Thinking to Design, 15-17 Oct 2014, Oslo, Norway. Design, as a discipline can make significant contributions through framing complex issues. This paper explores the values that design practice can offer in the field that cannot be created from a distance with a traditional solution seeking process. This paper presents research showing the benefit of having designers in the field and is based on a project taking place in a Mayan-community in Campeche, Mexico where design thinking was utilized as a tool for achieving sustainable societal change and increasing proactive planning in the community; specifically by generating concepts for improving healthcare. The case study herein presented, ´Artesanía para el Bienestar` (Artistry for Wellbeing) includes fieldwork that took place in the community in 2013. The goal of the fieldwork was to find solutions to increase the community´s access to healthcare and to involve a specific group of stakeholders, artisans, to this process of developing the future of the community. The essence of this paper is not to examine the result of the design process in regard to concepts and solutions created around the topic of healthcare, rather it presents the values and multiple benefits a design process in the field can bring apart from the “end-result” solutions. This case study contributes to the discussion of the role of design, and encourages designers to try new possibilities and directions in design. To achieve sustainable societal change, these aspects of design should be considered and recognized as values in future projects. Research in emergent areas such as social design and social innovation need to grow to support this process. Fuad-Luke (2013) argue that the potential of design research work to lever positive change is significant if it can move beyond the confines of academic discourse, scale up, and find mutually interested partners for these projects to capture the popular imagination.